It's hard to believe my Little Dude has stepped out into the world, so to speak, as he recently joined preschool. He's three and a half, and at an age where he definitely seeks interaction with other children and finds it 'boring' to be at home sometimes! I expected many changes as the first day of preschool approached, but we had been preparing ourselves for it for many weeks. It wasn't just him, but us who needed to be mentally prepared too. I knew there would be changes in routine, and perhaps, behavioural challenges too. But we hoped for the best, and are doing far better now than I thought we would. 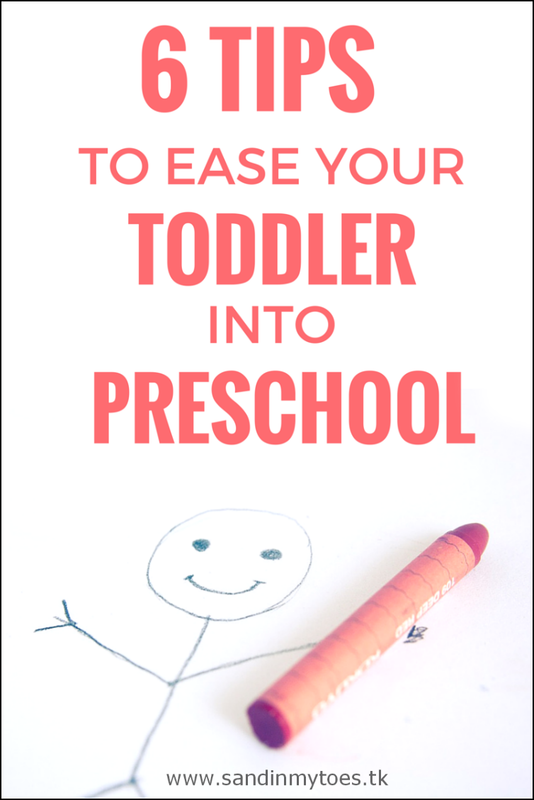 My tips for helping toddlers into preschool are best suited for kids who have never been in daycare or demonstrate separation anxiety. But almost all toddlers (they not even be 'toddlers' by then) experience a few hiccups as they enter the preschool stage. I use the term 'preschool' loosely to describe schooling which involves some organised activities and learning. Your toddler probably won't understand the concept of 'school' at first, so choose your words wisely when you talk about it. Focus on the positives - about the things they will learn, and the games they will play. You don't have to hide the fact that you won't be there with them, but mention it in a positive context.You can read books about starting school or talk about a sibling or a friend who goes to school. Use every opportunity to visit the preschool you have chosen. Show your child around the place, and talk to the people they will be meeting every day. Encourage them to ask questions. Show them as much of the place as you can, including the play area, lunch area, and the toilets. We visited our school about 4 to 5 times with our toddler before he started, so it wasn't an unfamiliar place to him. Check with the teacher about what their schedule is generally like, and play school with your toddler at home. Tell them about things like circle time and group activities, so they know what to expect. Get a copy of the curriculum and talk to them about what they will be doing the following day. It gives them something to look forward to, and share any worries. For instance, some toddlers are not comfortable with messy play, and you can discuss this with their teacher. If there are certain things they don't want to participate in, talk to the teacher about letting them sit it out. The best way to transition your toddler into the preschool environment is to work closely with the school. Talk to them beforehand about all possible scenarios that concern you, and how you expect them to deal with it. Remember, you know your child best, and it will take the teacher a week or two to understand their personality. Talk to the school about allowing you a flexible schedule to drop and pick up the child until he or she has settled down. No matter what you're told, don't leave without saying goodbye and giving a hug, if needed. Tell them repeatedly that you will be back. Don't leave a child who is obviously hysterical because that may create negative association with school and worsen separation anxiety. Sometimes, it is okay to leave a child who is only protesting and not crying if you know it is only due to your presence. But in the end, you know your child best and can gauge if they will be okay or not. Stick around, or call up the school a little later to see how they are doing. Your toddler may surprise you and begin school like a champ, but it's quite possible that they may refuse to go in a few days. Many children don't take well to the new routine and miss their loss of 'freedom', but if you feel that preschool is best for your child, stick with it. Try not to skip school because of meltdowns, but try to calm them as much as possible (read my tips for calming a toddler). You may even find that an unpleasant experience may put them off school. In such cases, try to find the root cause of anxiety and address it directly with the teacher. Above all, be relaxed! Your anxiety could pass on to your child, so try to be calm and stay focused on the good times ahead. If you haven't decided on the school yet, check out my tips for choosing the right preschool. Great tips. I agree with point number 6. My daughter started school with a zest of enthusiasm, but along the way after a few months she was hysterical and refused to let go, all on, one fine day. In our case few factors caused a change in her behavior, her favorite nanny went on leave and an impatient nanny replaced her, her teacher had changed, the bus timings got a bit early. So the best is to take each day as it comes. And the child and his/her feelings are the first priority, always be tuned into it. True, changes can have a big impact on kids this age. You just reminded me that I need to have my son visit his preschool for next year. They have a meet and greet but I think it will be best for him to visit a few times. I totally agree with not sneaking out. Everyone pays for it later. The visiting ahead of time is great advice, too. These are so good. Especially number five, which is so hard to do because easy to sneak out but meaner, later! Thanks! Great tips! Especially about sneaking out. I never did that. I would always make sure they saw me, hugged me, heard my voice, and knew that although I was leaving I would definitely be back soon. These are great tips and would agree with them all. So far I've only once had to leave Jessica crying - I didn't sneak out though, I gave her a big cuddle and told her I would be back later and she had stopped by the time she was inside which was a relief. We get the odd moment now where she tells me she doesn't want to go and I focus on all the positives and remind her of all the things she enjoys about preschool. My son's still reluctant but am glad he's settling down! Definitely great tips Tarana!! They need our guidance into this brave new world!! N has been in nursery since 12 months old, and luckily he's always been good at settling in - both as a baby, then moving rooms, and adding nursery school to his day nursery. I think it's such an important part of getting them ready for school, and he's really benefited. It's great that he settled in well! Thank you for these great tips! My lo is only 1 but I know school time is not that far away.